Mendelson's Memos: Review: The Muppets (2011) is a touching and hilarious tribute to the iconic characters, plus a commentary on the pros and cons of nostalgia. Review: The Muppets (2011) is a touching and hilarious tribute to the iconic characters, plus a commentary on the pros and cons of nostalgia. There is a part of me that doesn't want The Muppets to be a box office smash. It's a wonderful film, one of the very best movies of the year, in fact. But there is a part of me that doesn't want this to be the opening chapter in another deluge of new Muppet movies, television shows, and the like. The film, as it stands, works fine as both a standalone film and an introduction to the world created by Jim Henson some forty years ago. But it also has an unexpected power as something else: a farewell of sorts. It is about the heartache of losing touch with old friends and not getting that last chance to say goodbye. It is about, among other things, how we, as a society, seek a kind of closure for certain chapters in our lives, and can sometimes feel incomplete if we don't get it. Maybe this new film will be a gateway drug to a whole new generation of kids, and I cannot begrudge them the pleasures that Kermit and his friends have given me. But this new entry has our felt friends emerging out of exile and in arguably peak form, and it makes a strong argument for ending on top. Come what may, The Muppets, if need be, exists as a triumphant last hurrah and/or fitting finale to a entertainment property that never really got its 'one last show'. A token amount of plot: The film takes place in 'the real world', albeit ones in which the Muppets live among us without comment. The old gang has long since separated, and the world has seemingly forgotten them. 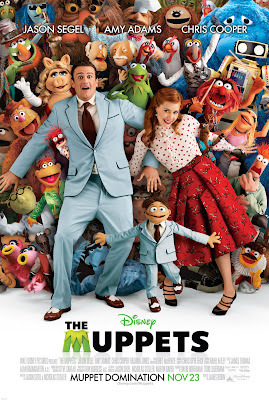 But after discovering that a greedy oil tycoon (Chris Cooper, with the best evil laugh this side of Mark Hamill) plans to tear down the classic Muppet Theater, young 'muppet' Walter teams up with his human best friends (Jason Segel and Amy Adams) in order to find some way to save the institution. Now, if Kermit can just get the old gang back together for one last great show, they might be able to raise the $10 million needed to save the theater. Yes, the 'McGuffin' (must save the theater from an evil tycoon, played back in 2002 by Joan Cusack in peak babe-hood) is pretty similar to the underrated A Very Muppet Christmas, but the picture is good enough that we may have to let that slide. 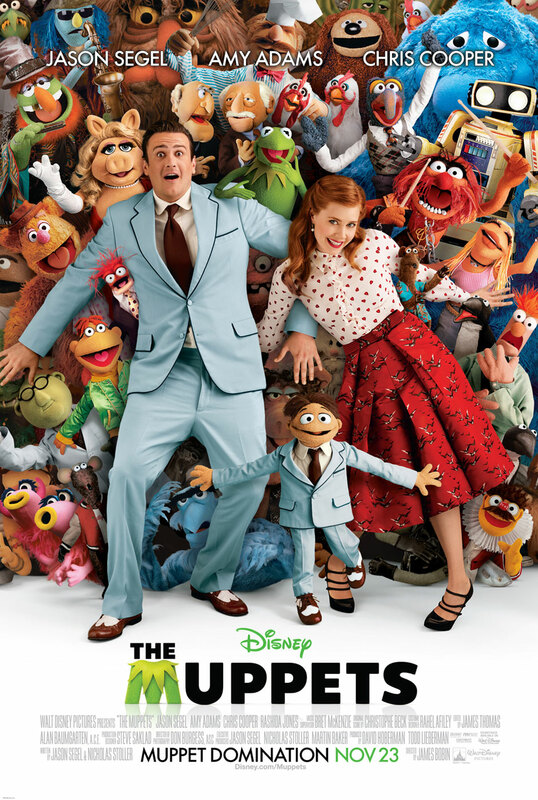 First and foremost, despite the heavy presence of Segel and Adams in the marketing materials, they are clearly supporting characters and in the service of the Muppet-driven narrative. While the humans (and Walter) take center stage during the initial reels, the film quickly becomes about Kermit's journey and Kermit's pain. There is a heartbreaking song number in the first act, "Pictures In My Head", which eloquently spells out one of the movie's core themes - the danger of holding onto the past glories. It is ironic, in a film whose marketing campaign has been so heavily based in reminding us older moviegoers how much we loved the old gang back in the day, that the film eventually becomes a case study in nostalgia and how it can prevent us from moving on in our lives. As Kermit tracks down each of the old Muppet cast members, he finds some of them have done well in the interim (while some have floundered). All of them are eventually willing to reunite, and the film has the courage to question, however subtly, the wisdom of attempting to replicate past glories. The picture implicitly questions the current trend of Hollywood executives relentlessly shoving recycled versions of their own childhood entertainment down the mouths of today's kids, even if this film serves as a prime example of said phenomena. Yes, sometimes the reinvention works (the new Looney Tunes Show), but there is no shame in acknowledging that a certain entertainment property has reached the end of its natural life cycle and put it aside in order to create something new. The drive to keep every remotely popular property alive and/or reinvigorate even not-so-successful properties (see - Tron, Teen Wolf, etc) is something that The Muppets is both an example of and a commentary on. The two major characters, Segel's Gary and young muppet Walter, are both gripped by their obsessive love of the Muppets, although their fondness leads them to different paths. Without going into details, Walter's nostalgia leads him to finally embrace something resembling adulthood, while Gary's love of Henson's creations has the more standard effect, in a fashion that jeopardizes his relationship with the woman he loves. Amy Adams has little to do here, but she does get one song, and her relationship with Gary (a love affair more chaste than the first three Twilight films) is contrasted with Kermit and Ms. Piggy's far more complicated and arguably less healthy infatuation. Frankly, one of the main flaws of the film is that it delves into the Kermit/Piggy relationship with such realism that we end up noticing how creepy and co-dependent it really is (at one point, Kermit blames Ms. Piggy for making him 'do things that hurt you'). But putting aside deeper meanings and somewhat complicated relationships, the film works splendidly on the surface level. It is bright, colorful, energetic, endlessly warm, and laugh-out-loud hilarious. The screenplay by Jason Segel and Nicholas Stoller is endlessly inventive in the ways it acknowledges its own conventions, and it earns countless laughs with its meta-commentary ('How about we save time and pick up the rest of the gang using a montage?') without ever becoming smug or obnoxious. The songs are a mixed bag, as the opening number is a bit of a drag (even if the pay-off is a killer), while the second-act climax song "Man or Muppet?" is so damn good that I sincerely hope it wins an Oscar. Said song also contains the best cameo in the film, which I wouldn't dream of revealing here. While the focus is primarily on Kermit and Walter, every other Muppet gets a moment or two to shine. Personally, I wanted far more Statler and Waldorf, but them's the breaks. Ironically, in a film that may or may not function as a 'last goodbye', the picture doesn't know when to end. There are two (2) absolutely pitch-perfect climactic bits that darn well should have been the fade-to-black moments (you'll know them when you see them, and you may be welling up/crying during both of them), but both are then followed by somewhat redundant wrap-up material. Still, minor quibbles and all, The Muppets is easily among the best films in the franchise, as well as one of the best films of 2011. It is a wonderful gift for those who loved the Muppets as well as a ceaselessly funny and surprisingly thoughtful stand-alone family-friendly romp. See it, not just with someone you love, but with someone who loves the Muppets. Whether or not this will be the first in a new generation of Muppet entertainments or not, the film as it stands offers us, at long last something that we never got a chance to do. The Muppets gives us a chance to say a proper farewell to Jim Henson, to forgive him for dying on us so young and unexpectedly, and to acknowledge the monumental work he gave us in the time he had. Goodbye, Jim. And thank you. 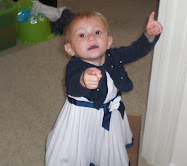 I agree with everything you said with a couple of points. I thought the cheesy opening number was awesome because it was so over-the-top. We have been mocking it and singing parts of it as a family for days. Also, I thought the draggiest part of the movie was when there were essentially back-to-back musical numbers that were kind of weak: the Amy Adams diner song and the uncomfortable rap. Both under-utilized the talents of the actors in this unique opportunity to shine. Great explanation of the creepy relationship moment and the commentary on repackaging old brands to a new generation. I wouldn't have thought of it like that, but I see exactly what you mean when you say it. I loved this review. Couldn't have said it better, especially the end bit about Jim Henson. He's the only celebrity who's death ever made me cry, and I remember it like it was yesterday, and your right. We never did get to say goodbye. This movie might have been a bit cathartic for me, and you, sir, are a genius for picking up on just how that might have worked. Does the Twilight Saga endorse its own story? Titanic 3D gets a somewhat obnoxious trailer. Scott Mendelson returns to podcasting.